So Christmas appears to be creeping up on us..! 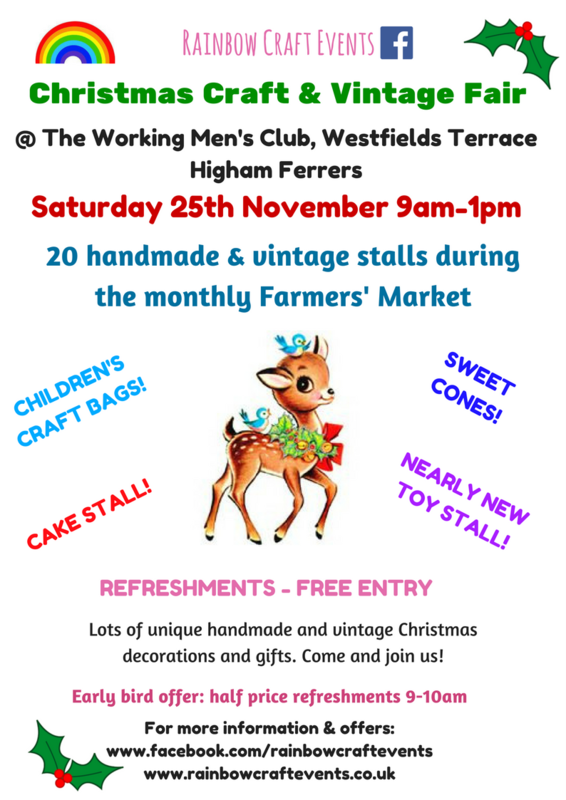 Not long now until the first of two festive Craft & Vintage Fairs at the Working Men’s Club, Westfields Terrace, Higham Ferrers on Saturday 25th November 9am-1pm. The December one will be on the 23rd. These events are held monthly at the same time as the popular Farmers’ Markets so why not pop over to Higham Ferrers and visit both! It’s free entry as always and half price hot drinks 9-10am. Please spread the word and tell local friends and family about these fantastic Craft & Vintage Fairs in Higham Ferrers! Thank you to all the stallholders and customers who came to today’s Craft & Vintage Fair at the Working Men’s Club, Higham Ferrers. We had some lovely handmade and vintage stalls including crochet and knitted, garden ornaments, handmade jewellery, vintage clothes and accessories, upcycled painted furniture, cakes, sweet cones, cards, t shirts and bags, fabric gifts, yarn and needles etc, book art, personalised frames, door plaques, prints made from hand, finger and footprints, pyrography plus lots more! As always, it was free entry and early birds could make the most of a half price hot drink 9-10am. Due to popular demand, we are also now having a nearly new toy stall to keep the little ones busy. The next Craft & vintage Fair will be on Saturday 28th October 9am-1pm so I hope to see you there! BBC Radio Northampton visiting Craft & Vintage Fair! So only a few days to go until the 1st Craft & Vintage Fair of 2017 and I’m really looking forward to it! We have a very special visitor too – Jules from BBC Radio Northampton and Three Counties will be visiting so listen to your radio around 11am! We’ve got a great event lined up for Saturday (Higham Ferrers Working Men’s Club 9am-1pm) with several new stalls. I like to maintain a good mix of stalls to keep an interesting mix of handmade and vintage items for customers. This month I’ve been busy making vintage cake stands, felt ball garlands, felt brooches and magnetic pegs for holding photos etc on the fridge. We’ve also got Scrabble pictures, vintage and upcycled clothes and accessories, furniture and homeware. Phillip will be there with his wood carvings raising money for the NSPCC, there’s fabric gifts such as memo boards and bunting, knitted and crocheted items, cross stitch kits, make your own kits, jewellery, yarn and needles, toys, bags, cushions, fudge and items made from vintage and antique forks! Such a fantastic range and definitely something to suit all tastes! From 9-10am it will be HAPPY HOUR and all customers who come nice and early can have a FREE HOT DRINK! We’ll be selling drinks and refreshments throughout the morning as always and entry is free so please do come and join us and support your local community! Plus the Farmers’ Market has some new stalls this month too so come and check them out! With Valentines Day only a few weeks away this is an ideal opportunity to come and buy something unique for your other half! See you Saturday! It was all going on in Higham Ferrers today! Not only was it the Farmers’ Market, there was also the Neighbourhood Garage Sale and an Artisan Weekend in Chichele College. So lots of people to come to the second Craft & Vintage Fair at the Working Men’s Club. I spent a couple of hours at the market handing out flyers – lots of positive feedback from people although still many people hadn’t noticed the signs and banners around town advertising the event so I think handing out flyers each month will really help to spread the word! When I went back to the hall I recognised lots of people who I’d given flyers to so at least that shows they had made their way round! The lady running the Artisan weekend also took some flyers to give out which I thought was very kind. We had a great mix of stalls today including wood turning, wooden planters, upcycled furniture, fabric gifts, jewellery, cakes, crochet, needle felt animals, photographic prints and pyrography (wood burning). Several customers commented to me on how pleased they were with some of the items they had bought and one stallholder commented that some customers had come back to see her from the previous month as they knew which items they wanted to buy. Lovely to hear! I would still love more vintage/retro stalls so if you know anyone who may be interested please do ask them to get in touch. My email is rainbowcraftevents@yahoo.co.uk. Thank you. Lots of stallholders have been asking to book dates for 2017 which shows great confidence in the Craft & Vintage Fairs which I really appreciate. I will now start taking bookings for next year. To maintain a good mix for customers I will initially limit bookings to up to 6 per stallholder for 2017 although I am happy to place people’s names on the waiting list for any extra months they’re interested in. As time goes by, I feel these Craft & Vintage Fairs will become a well established event in Higham Ferrers meaning even more customers. If you enjoyed coming today, please do let other people know! The next Craft & Vintage Fair at the Working Men’s Club will be on Saturday 24th September 9am-1pm. Free entry as always. See you there!